Single-turn encoders measure displacement across 360° from a defined starting position with the output repeated for every revolution of the encoder’s shaft. 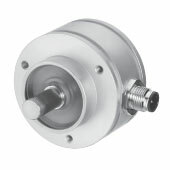 Multi-turn encoders measure the degree of rotation within 360 and track the number of total revolutions of the encoder’s shaft using a unique word for each position and number of revolutions. A single-turn encoder is analogous to a watch with only a minute hand (left). After 60 minutes, the watch resets and does not record the total number of turns, or in or this case, hours. A multi-turn encoder is like a watch with a minute and hour hand. 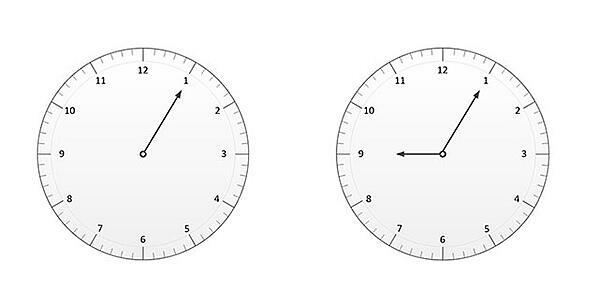 At any given moment, both the position of the minute hand and the total number of turns of the minute hand (hours) can be read. Single-turn encoders are ideal for applications measuring less than 360° of rotation such as measuring the pivot point of an angle or measuring partial rotations of a shaft. For example, a single-turn encoder can be used to measure the pivot point of a door or gate to determine the angle of the opening. A single-turn encoder may also be used to measure the pivot point of a rotating antenna to determine its angle. Single-turn absolute encoders are also commonly used in permanent magnet servo motors to provide the position of the motor stator in relationship to the rotor upon startup for improved torque control. While a motor makes multiple turns, many applications do not require tracking the total number of rotations, only the position within one rotation. 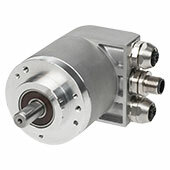 Multi-turn encoders are ideal for application measuring both the degree of rotation and the total number of rotations. They are also ideal for measuring longer lengths of linear motion where it is not possible or economical to use a linear encoder or when the pivot point of rotation is not accessible. For example, tracking the motion along the circumference of a large satellite dish, measuring the rotation of a slip-ring or measuring travel of a well-depth logging system. Multi-turn encoders are also ideal for servo motor feedback when the application involves coordinated axes that are offset. With a single-turn encoder, the offsets would be lost when the system loses power and the system would need to be homed. While a battery backup can help prevent this, the system would still lose position if it mechanically moves while the power is off (e.g. if an operator manually moves the device). With a multi-turn encoder, the offset position can be programmed into the logic of the machine. For example, if a semiconductor manufacturing system loses power while processing a large wafer, rehoming the device and returning to its prior position within the nanometer is near impossible and could result in the entire wafer being scrapped. 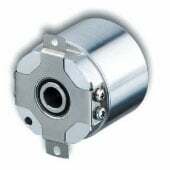 Therefore, applications like this use multi-turn encoders that allow for the position to be mechanically saved on the encoder in the event of a power loss. Some incremental encoders include a special channel on their code disc known as the index channel, or Z-channel. This is a separate channel with a single opaque region. Each time the code disc completes a full rotation, the Z-channel generates a single pulse. The readout device can use this pulse to count the number of full turns the load makes, and use up /down counting to track partial turns. The number of full rotations a multi-turn incremental encoder can monitor is limited only by the processing and storage capability of the readout device which is normally a microprocessor. The primary drawback of an incremental multi-turn encoder is that it loses all information at power shutdown. To overcome this limitation, a battery backup can be used to allow the data to be saved. However, if the system moves mechanically after the power is lost, the system will need to be homed, unless the battery backup and a counter are present on the encoder side. The simplest version of a multi-turn absolute encoder involves two discs: one for monitoring ±360° and a secondary code disc for monitoring full rotations of the primary code disc. The two are connected by a complex gearing system that indexes the secondary disc for every full rotation of the primary disc. A Wiegand-wire can be used to create a gearless multi-turn encoder that records turns by inducing a change in a magnetic field causing a wire to generate a pulse once per encoder revolution. The pulse powers a counter inside the encoder that then records the revolution. With fewer mechanical components, Wiegand-sensor absolute multi-turn encoders are generally more compact than other multi-turn encoders. 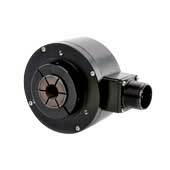 Less friction is generated inside the encoder thanks to fewer mechanical components. Is a Multi-Turn Encoder More Accurate Than a Single-Turn Encoder? 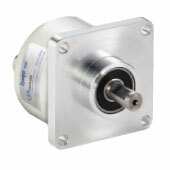 Compact magnetic absolute encoder built with oversized bearings, wide temperature range and optional IP69K sealing. 12 bit ST, 12-16 bit MT. SSI Gray or SSI Binary interface, shafted or hub-bore mounting, up to 22 bit single-turn or 12 bit multi-turn resolution.